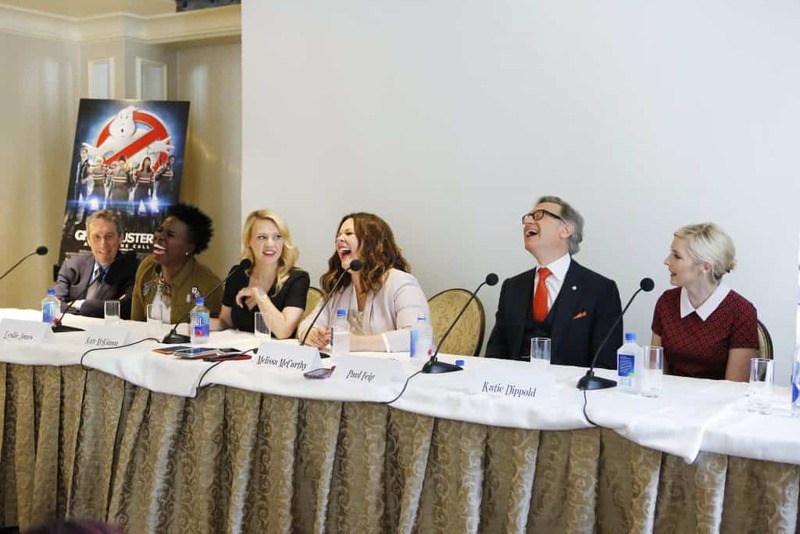 I am so excited to share with you the Exclusive Ghostbuster 2016 Interviews from Sony’s new movie! 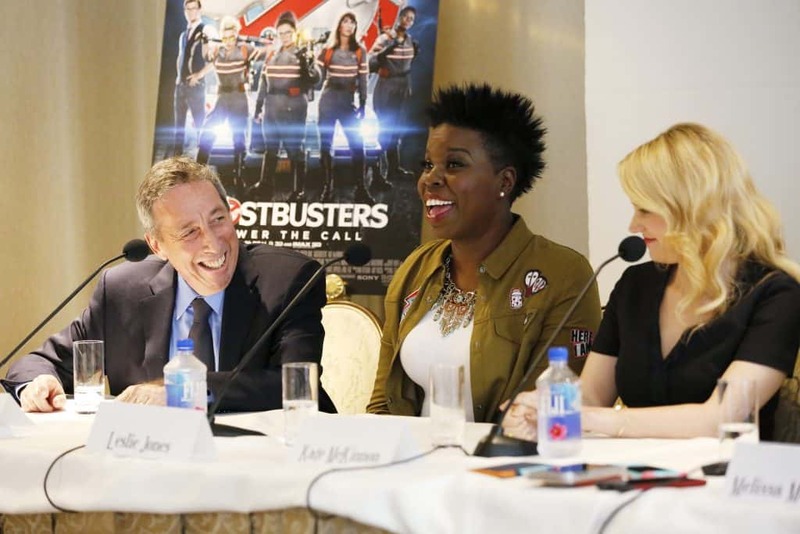 After touring the Sony lot with Ivan Reitman, then having him be a part of a panel with Katie Dippold, Paul Feig, Melissa McCarthy, Kate McKinnon, Leslie Jones, and Ivan Reitman and it was amazing. This Blogger press junket travel expenses were covered by the studio. All opinions are my own! I will be publishing my Ghostbusters review soon and you will get to read about how much I loved the movie! During the Press Junket questions were taken from us bloggers and from Facebook Live. Even Chris Hemsworth asked a few questions during the junket! I am not sure I ever laughed so hard at a Press Junket! So what was crazy is that I couldn’t tell if every single answer was made up or if these ladies were telling the truth. They were just in funny mode the entire time! If you are wondering where the talented Kristen Wiig was, she was sick and had to skip out on the press junket. 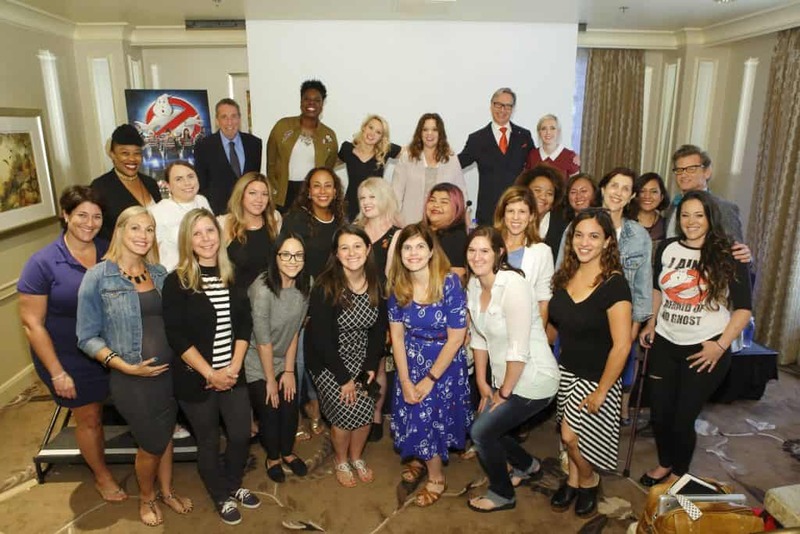 Los Angeles, Ca– July 8,2016: Bloggers attend a Press Conference at the Press Junket for Columbia Pictures’ GHOSTBUSTERS at the Four Seasons Hotel. What makes this press junket unique is that although there might be a tiny spoiler or two, they actually went LIVE on Facebook! We chatted everywhere from ghosts, to work, to cats, and to Chris Hemsworth! 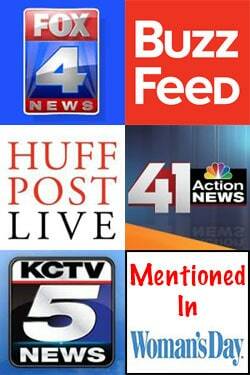 Check out our entire interview below during the bottom of the post! I included a link to the E News Facebook Live video! 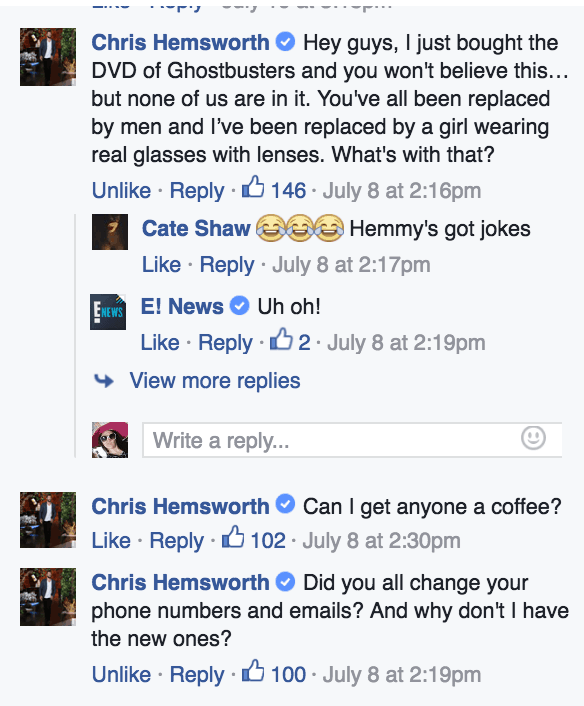 About Chris: So during the interview Chris Hemsworth got online and started asking questions during our interview! He is so stinking dreamy and funny! You will LOVE him in Ghostbusters! If you can turn into a ghost to haunt your cast mate what form would you take? Leslie: Hummus because they LOVE hummus! Melissa: I would take the form of some type of cat. Then I would live with Kate and know some type of pampering. Leslie: It take a real designer to make clothes for REAL women. Real women is who buys clothes! 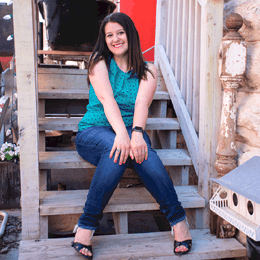 Melissa: I started a clothing line because I couldn’t shop. About the Packs: Leslie complained a lot about wearing the packs! Melissa went back and forth on trying to decided if she should add a little bit of weight to Leslie’s pack. Then she decided she didn’t want to get killed! About Kate: Katie tells us that Kate is a secret scientist. She brought a sauder kit on set! Kate said, “Physics is FUN!” during the interview! Cameos: During the interview Ivan mentioned about if it was difficult to get the cameos or if he just had to call them up. Ivan mentioned you never just “call Bill”. He said it was easy and this time around it only took a couple of phone calls! In theaters July 15, 2016! I am so, so excited to see this movie! I loved the original Ghost Busters, and this cast is so incredibly talented. I think this reboot is going to be great. At first I was on the fence, but with a cast like this, I can’t see how it could miss. 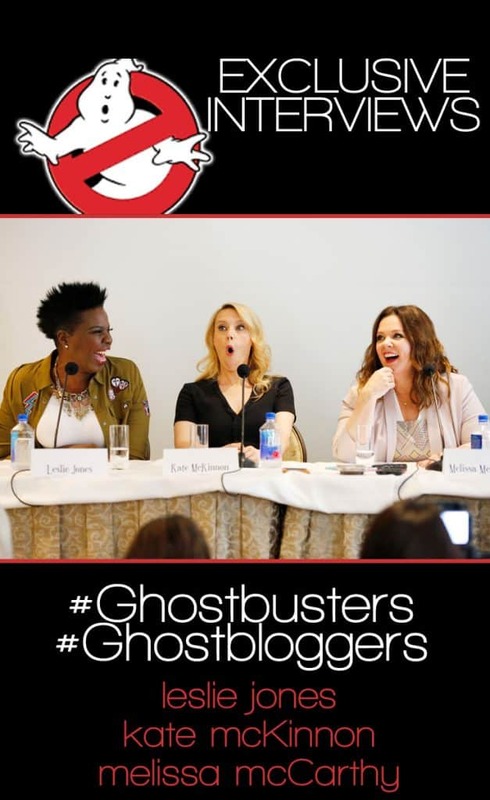 This Must Of Been So Much Fun They All Sound Like Crazy Funny People, I Loved The First Ghost Busters I’m Sure I’ll Love This One Too!! I Can’t Wait To Take The Kids!! These ladies are super funny on their own and even better together. I am really looking forward to seeing this film!